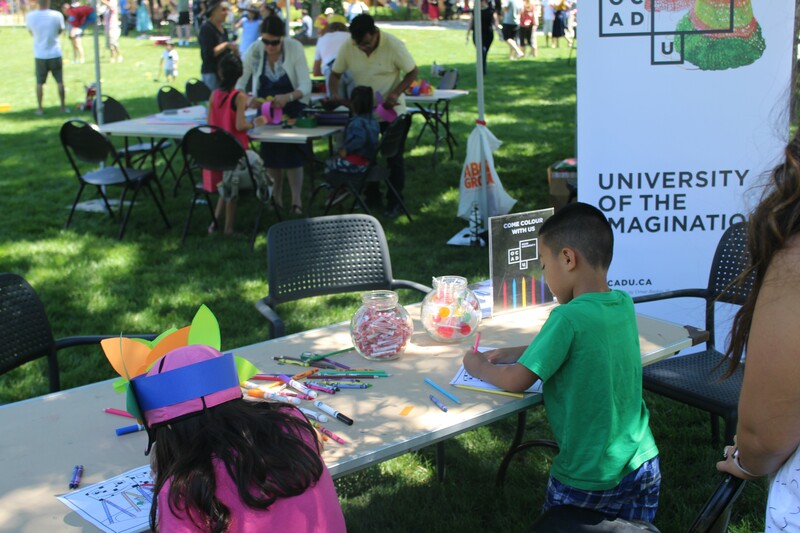 After 15 months of construction, historic Grange Park officially reopened Saturday, July 8, with an afternoon of musical performances, magic, croquet and other free activities. 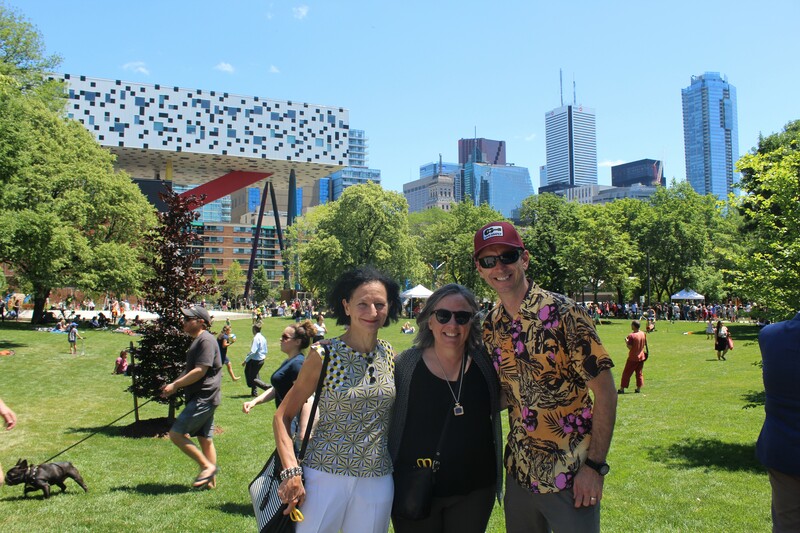 Two hundred people cut a 600-foot ribbon, including OCAD U President Sara Diamond, MP Adam Vaughan, MPP Han Dong and City Councillor Joe Cressy. 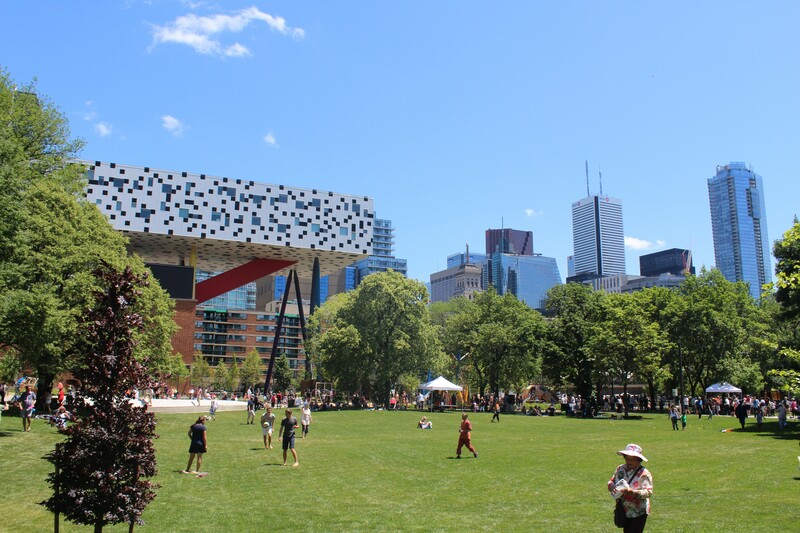 Flanked by the AGO to the North and OCAD U’s central campus to the East, Grange Park has long been a space for students to relax and socialize. New furnishings and an improved layout will make it even more inviting for the entire neighbourhood. Two new playgrounds, a splash pad and an off-leash dog area are among the improvements, and the Henry Moore sculpture, Large Two Forms, has been moved from its Dundas and McCaul Street corner to the park, where it can be appreciated from all angles. OCAD University has had a place at the Grange Park Advisory Committee (GPAC) table since discussion of the renewal began. It’s estimated 150,000 people live within walking distance of the park. The Grange Park Advisory Committee invites you to celebrate the completion of the park revitalization project! Join President Sara Diamond, Gillian Siddall, Vice-President, Academic and Robert Luke, Vice-President, Research & Innovation for the ribbon-cutting ceremony at 1:30 p.m. when 200 pairs of scissors will be handed to the public to cut the 600-foot ribbon. The Grange Park revitalization project has increased the number of trees in the park, and includes two new, large playgrounds as well as a splash pad. Perennial flower beds are surrounded by new benches and seating. An off-leash dog area, washrooms and improved lighting have been added. As you may have seen, the Henry Moore sculpture, Two Large Forms, is now in the park where it can be viewed from all directions in a new, grassy setting. OCAD University has appointed Dr. Robert Luke as Vice-President, Research & Innovation, effective August 29, 2016. Reporting to and working closely with the President as a member of the executive team, Luke is responsible for the strategic leadership, implementation and expansion of the university's research and research-creation capacity, including its research infrastructure and the development of academic business and incubation initiatives. With over 15 years of experience working in progressive and growth-oriented academic environments, Luke is a recognized leader in research, innovation and research administration. He currently holds the role of Vice-President, Research and Innovation at George Brown College, where he created a nationally recognized applied research department that has raised over $80 million in funding support from government and industry sources. George Brown College was named top research college in Canada by Research InfoSource last year for its achievements in funding and partnerships. During his time there, Luke also oversaw the department responsible for e-learning and teaching innovation. “With his ability to engage partners and his consensus-building approach, Dr. Luke will be an asset to OCAD University's growing research portfolio, supporting an increasing number of undergraduate and graduate students and faculty in research, creative activities, innovation and entrepreneurship. I am delighted to have Dr. Luke join us as the university's Vice-President, Research & Innovation,” said Dr. Sara Diamond, President and Vice-Chancellor, OCAD University. Luke holds a BA from the University of Northern British Columbia, an MA from Queen's University, as well as a PhD from the University of Toronto. He maintains an active research program in human-centred design of technology, accessibility and health systems for patient empowerment. In 2012, he was awarded the Queen Elizabeth II Diamond Jubilee Medal for contributions to Canadian education and innovation.